I'm going to show you how to create a complex, interactive web component with React. To this end, I will be creating a 5 band resistance calculator. This component will consist of an SVG diagram of a electronic resistor component with coloured bands, indicators of resistance and tolerance and dropdowns for changing the colours of the 5 bands. Initially I wanted to use SVG gradients for the resistor fills, but they're not supported by React/JSX (Update: I've opened a pull request to fix this). 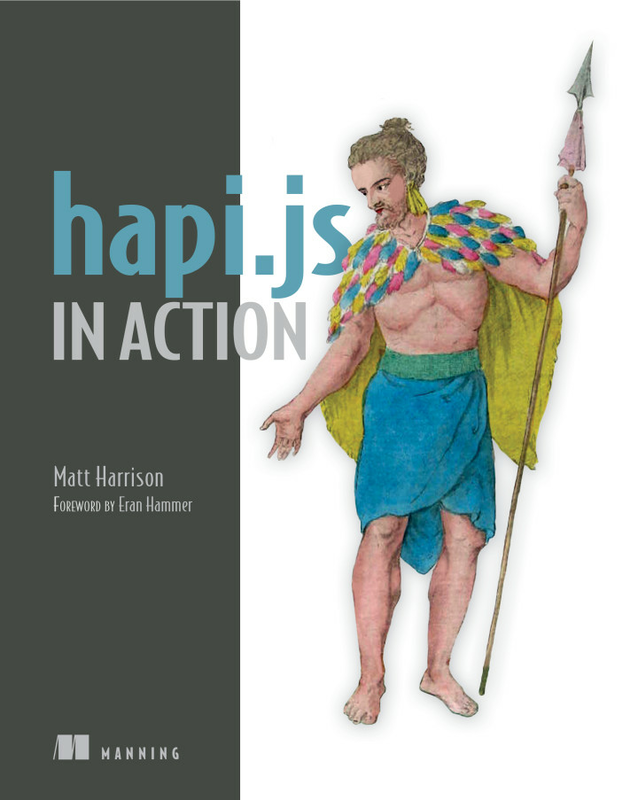 Firstly though, let's talk a little about React. When React was introduced to the community, there was mixed feelings, with some accusing Facebook of flying in the face of time-tested and accepted standards. This didn't faze the React team and they actually adopted a snarky tweet as their strapline! I won't give you a complete breakdown of the library, I suggest you read all the info on their page and have a look at the project on Github. After assessing the library myself I've found both pros and cons but I think overall the pros outweigh the cons. It's fast because it uses a virtual DOM diff to calculate operations. Mixing logic with Markup feels a bit dirty. I'll post the code for each component here with a small discussion of what's going on inside. This component displays the actual calculated ohmage of the resistor. Notice it doesn't actually do the calculation, a higher level component takes care of that. The only logic in this component is concerned with rendering an appropriate unit of resistance, be it Ω, KΩ or MΩ. This component only expects 1 prop to be passed, resistance. Similar to the OhmageIndicator, this component isn't very smart, it just takes a numeric value as a prop and shows it as a ±% or shows nothing if the tolerance is 0. The function printTolerance() is acting like a view helper in a templating language, taking a data model and prettifying it for ouput. return tolerance === 0 ? 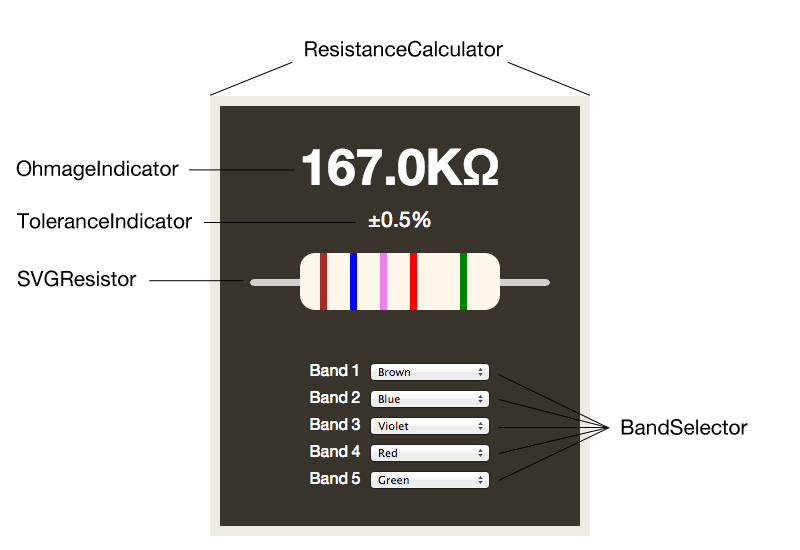 This component dynamically renders an SVG drawing of the resistor. It has a method to translate a band's numeric value to its corresponding colour via an object passed in as a prop. This renders a select menu. To communicate changes back to the owner, the owner has passed a callback as a prop, thus creating a line of communication back to the owner. The component will call that callback with some arguments to notify the owner it needs to update its state. This component is the glue that holds the calculator together and manages all the state, passes props and performs the resistance calculation. When the state in this component changes, and props that have been passed will also update the children's DOM. Please feel free to comment with suggestions or improvements.